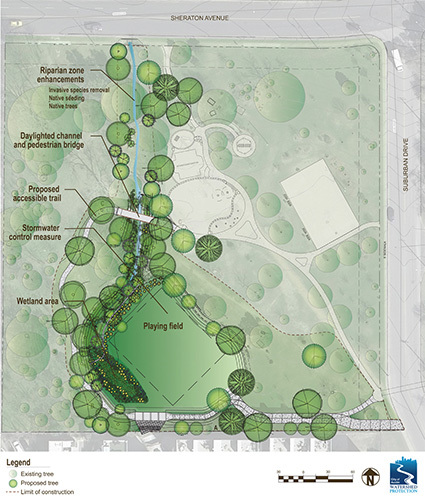 The Battle Bend Park Capital Improvement Project will create a new playing field within Battle Bend Park that doubles as a stormwater control measure to capture and treat runoff from the nearby commercial and industrial area during rain events. 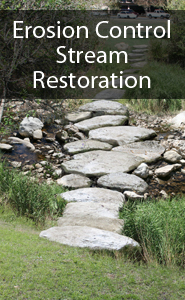 The stormwater control measure will filter this water through a sandy soil media that removes pollutants before the water enters Williamson Creek. During dry weather, the level, turf-covered field will provide a playing surface for informal recreation. Water will exit the facility within 48 hours of filling, leaving the field dry most of the time. The project will provide other site improvements, including removal of a concrete culvert running through the park and reconstruction of a more natural stream channel (known as “daylighting”), ecological restoration along the riparian corridor, tree planting, and trail improvements to increase connectivity and accessibility within the park. In January 2017 at the South Austin Recreation Center, a public meeting was held concerning the Phase 4 Water Quality Improvements of the Battle Bend Park Capital Improvement Project. The Watershed Protection Department (WPD) and the Parks and Recreation Department staff presented the project design elements, answered questions, and gathered feedback via an open discussion and comment cards submitted by attendees. Key Contact: Lee Sherman, P.E.